Because of special technology of preparation of grain and careful milling the Belyaevskaya flour has unique indicators of brightness, they are higher, than is established by State Standard Specification. Flour has a natural cream or light yellow shade. Production made of this flour shows magnificent qualities (good volume and crumb grain). 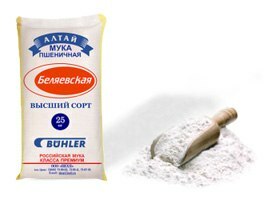 As a result of installation of the modern hi-tech inventory the Belyaevskaya flour became ideally clear, without any impurity. Because of high WAA of the Belyaevskaya flour, production of bread and other products from it is economic, technological processes of manufacture of bread are stable and do not demand padding expenses and changes, and the finished stock has excellent quality, high humidity and the long term of storage. Indicators of quality of the Belyaevskaya flour are higher, than established by State Standard Specification as develop it from perfect grain, on the modern equipment, strictly observing the production modes. Quality of flour so stable, what even in those productions where there are no specialized laboratories and the staff of technologists for its control, it is possible to easily make bakery products without failures and with set to indicators. For production of such production as croissants, pelmeni, pasta, confectionery, we offer specialized millings, which allow to let out ready-made products of excellent quality. If flour with special characteristics is necessary for preparation of any product, we will be able to make it. Our experts daily test quality of flour (more than 100 tons of production per day) in real industrial production on release bakery, candy stores, pasta, ravioli. As a result determine optimum parameters of flour for production of these products. Our professional technologists can make recommendations about use of the Belyaevskaya flour at the concrete enterprise, train in work with it and help to debug the production technology of finished goods. In many regions the firm representations having warehouses with flour where it is possible to get it wholesale are created. We carry out stable supply of flour to all regions of Russia and abroad the railway and motor transport. The main principle of activity of our organization - individual approach to each client. All our work is directed on satisfaction of inquiries of the client, on the account and performance of their wishes. What there were conditions, specifics of specifically your case, you can count on our understanding and cooperation, readiness to meet halfway. We care of that each our client remained is happy with the received result which is our general success! Decrease in costs for 5%. Increase in sales by 20%. All products is presented under the uniform trademark "Belyaevsky Flour" both in the territory of Russia, and in the countries: China, Afghanistan, Korea, Mongolia, Uzbekistan, Kazakhstan, Kyrgyzstan.